It’s the season for September issues. Kathleen just posted about Rihanna on the cover of British Vogue. We’re all waiting to see Beyoncé on the cover of American Vogue. 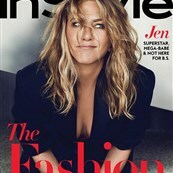 And now here’s Jennifer Aniston on the cover of InStyle. Writer Molly McNearney, who is married to Jimmy Kimmel, does the interview – so it’s Jen talking to one of her closest friends presumably to promote Dumplin’, which she shot last year, which I can’t find a release date for, and I’m wondering now whether or not they’re hoping it’ll be a late festival addition, in Venice or at TIFF or maybe the New York Film Festival. JA: I had so much fun. There are women devoting their lives to training young girls for pageants, and it’s the real deal. I loved those women and really enjoyed getting into the mindsets. My character is an ex–pageant queen who is fun but broken. It’s a beautiful mother-daughter story. And, of course, there’s the amazing musical element: Dumplin’is an homage to Dolly Parton, who wrote six original songs for this film. She has a whole album coming out when this movie is released. That, right there, is the most interesting thing we learn about Jen in this interview – that she does a “flawless” imitation of Dolly Parton. So, of course, don’t you want to hear it now? This is probably what she’ll be asked to do, over and over, if there’s a press tour to promote the movie. And that’s the purpose of this cover, this interview: to generate interest for Dumplin’, a film featuring women, produced by women, directed by a woman. My guess is that they’re still trying to find a distributor and as Dumplin’ is produced by Jen’s company Echo Films, that’s likely her focus right now, to convince people to put up the money so that we will put up the money to go see it. What’s the strategy then? Well, if this interview is anything to go by, there’s not much of a change in the strategy we’ve been seeing from Jen all along. Stability, certainly, is attractive to investors. But so is freshness. And, frankly, this interview doesn’t feel fresh to me. Apart from the details specific to the movie and Dolly, her quotes could have been pulled from three years ago, or ten years ago. There’s a lot of criticism about the tabloids and what’s been written about her. There’s some detail about how “zen” she is. There’s a question about a Friends reunion. To me it’s the same. And, like I just said, is “same” the way the sell this movie? I want to see this movie. I read the book, I’m curious to see the story onscreen. Will this be enough to get it there? She looks SPECTACULAR. Her legs look better than ever. The hair (by Chris McMillan, of course), I LOVE her hair when it’s this texture. The styling – suits, jackets, pants, masculine – all of it is amazing. Here – watch the video. Her fanbase would respond to these shots, this interview, and it’d be the same demo they’d want to appeal to for Dumplin’.